The Sunshine Coast is easy to fall in love with. Kim Carroll knows this because he was raised on the Sunshine Coast and spent his formative years surfing waves across every part of it. His wife Heidi Meyer also knows, as she visited the area in her youth regularly and knew, even then, there was something magical about the Sunshine Coast. Little did she know she would one day meet a local named Kim and that they would both settle here and raise their daughter Chalcot. Kim and Heidi have significant business experience between them having built and sold international businesses. Heidi worked, for many years, in celebrity media and later as an Interior Designer specializing in luxury hotel and spa design. She has always held a healthy interest in conservation and sustainability which came about when she stopped to consider the carbon footprint the ‘jet set’, many her friends and clients, were creating. She knew there had to be a better way. Heidi has lived and worked in London and the US for some 18 years. It was during her time working in travel and celebrity magazines that she first became aware of how consumerism and sustainability don’t always go hand-in-hand. Luxury often means more towel use, more table clothes, more food refuse, more packaging and more waste. Heidi began to ruminate about the powerful idea, and of course the juxtaposition, of ecology and luxury – meeting in an educative and gentle tourism first. Ideas flowed for many years about how she might one day create her own resort and spa. The type that would redefine the eco experience, attract celebrities, executive retreaters, world leaders and subsequent exhibitions, conferences and events. Fast forward several years from the day those ideas were formed (ideas shared passionately by Kim), and the opportunity quite literally came knocking. Six months after settling contracts on and renovating their tightly held estate, a-top of Buderim (an exquisite acreage expected to be their forever home and now the proposed Badderam site), a neighbouring property developer knocked on their door and delivered the news that he intended to excavate the stunning, age-old forest bordering all of the northern boundary of their nature preserve, to build a set of residential villas. Since returning from overseas, to live permanently on the Sunshine Coast in 2013, Kim and Heidi had identified a large opportunity for more luxury resort accommodation within the region. They knew their stunning estate was a rare remaining land parcel on the Sunshine Coast, ideal for the development of an elevated destination resort experience, exactly like the one Heidi had been dreaming of. The pair soon made their neighbour an offer to purchase and began to ponder how they might build not just a resort, but rather - a legacy. Heidi and Kim successfully engaged their community across every aspect of their resort application and design, including their Indigenous Kabi Kabi Gubi Gubi community, Buderim’s young leaders and many elderly. They assembled and outstanding team of industry professionals and embarked on an extraordinary journey, to design a sustainably built and operated nature resort - with many unique points of difference. 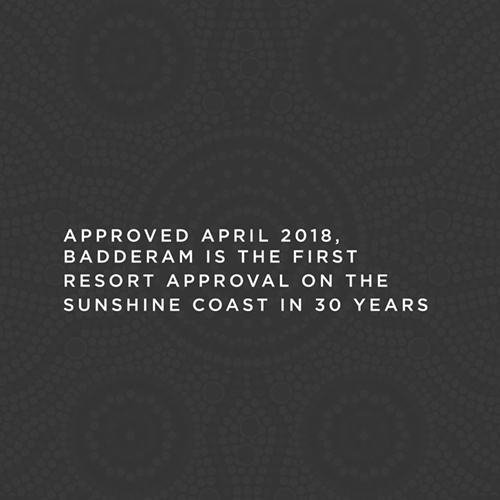 No self-composting toilets or cold austere rooms, the Badderam resort is intended to be a real-world, high-tech, eco-indulgence, with a focus on telling Australia’s cultural heritage stories and showing off the regions extensive list of food artisans and producers. It will include a world-class wellness spa, an Indigenous arts retreat and a Heli pad, for excursions to nearby world-heritage land marks such as Fraser Island and the Glass House Mountains. Also planned at Badderam is a purpose-built exhibition and event centre with a focus on facilities for congress and dialogue in-the-round. An ancient platform for collaboration revived, the centre is expected to attract thought leaders, sustainable technology exhibits, and to provide an enviable venue within nature for generating high-level thinking and churning out a stack of bright ideas. Expect regular workshops on ecological matters such as bee revitalisation, permaculture, seed banking and a plethora of other planet saving good stuff! It’s evident that Kim and Heidi really do envisage changing the world. They will utilise technology to enhance the guest experience and subtly educate guests, suppliers and an entire region, to do their part. I am filled with admiration for the couples aspirations regarding the resorts charitable foundation and also filled with belief, that these two know how to make this eco adventure for Queensland – really fun! Heidi says she’s redefined the fairly mundane parameters of what the tourism markets knows as 'sustainable' travel, to become much more luxurious, much more indulgent and yup as I thought, much more enjoyable. Whilst she’s been designing in the luxury spoils, she’s had her team on task to; make the destination Queensland’s first zero waste resort; grow a percentage of food within the resorts landscape design and to make sure the resort can generate and store clean water and clean electricity. The premise: to show that luxury and sustainability can be at one. With their nature filled hideaway offering a secluded hinterland feel just minutes from the regions CBD, beaches and tourist crowds, there can be no doubt that what they have envisaged in beautiful Buderim, is tipped to be a jewel in Queensland’s tourism crown. The benefits for their local community are also outstanding, as the resort will return affluent tourism to the Buderim Village, future proof the Buderim business economy and generally revitalise the precinct with an infrastructure and employment asset. Kim and Heidi are committed to the creation of Badderam now four years in the making, with a resort approval issued on April 19th, 2018. Some achievement, this is the first resort approval to be issued on the Sunshine Coast in 30 years. As more and more land in and around their site is offered to them for purchase, so it is that they have continued to create an even greater vision for Badderam, an eventual regenerative master-planned community adjoining the resort, offering access to all of the resort facilities. “Think of it as a new Tesla village”, Heidi says. What a wonderful way to live I say, in a sustainably built paradise with a fleet of Tesla’s on tap! The visionary couple are now seeking capital investment or an owner operator with whom to continue their journey. They are hoping to find a partner who shares their remarkable ethos and at the same time, they appear to understand that they must remain flexible as to how their vision will be realised, keeping open to the experience of the market, as well as the wisdom of hotel developers who have gone before them. Heidi is Badderam’s Creative Director and Kim has taken on the role of Investment Director. Heidi and Kim believe their coast is fast becoming the ‘Eco-Smart Coast’ of Australia and the world and that never has there been a more exciting time to invest in tourism on the Sunshine Coast.